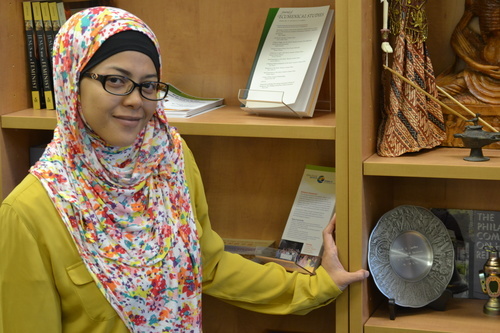 Living and Learning Religious Diversity in the U.S.
Farinia (Nia) Fianto is a Community Solutions Program fellow from Indonesia, serving as an intern at the DI for the fall semester. She is Managing Director for the International Center for Islam and Pluralism (ICIP) in Jakarta. Click here to learn more about her! When I told my friends that I would go and stay in the United States for four months, I received everything from congratulations to warnings, and all of these responses made sense to me. They demonstrated to me the mixed feelings and opinions around the situation in America, particularly dealing with minority groups (Muslims belonging to this category). From the attacks on mosques, Qur'an burnings, anti-Muslim rallies and the recent Chapel Hill shooting tragedy, it's clear that Islam and Muslims are still targets of bigotry, and Islamophobia still happens despite the fact that the U.S. government has taken some action to address it. To be fair, my knowledge of the U.S. is entirely based on the narrative that I have seen portrayed within movies, books, music and most importantly, the media. My perception before and after the 9/11 tragedy has also changed drastically when it comes to religious freedom and minority rights in the U.S. Before 9/11, I dare to say that I was fond of American culture, and as a matter of fact, I used to have my own version of the "American Dream" where I would travel to the U.S. and learn more about how Americans practice their freedom. However, post 9/11, with the situation drastically changed, my opinion and perception of the U.S. and its people regarding Islam and Muslims has been deeply impacted. I was deeply disappointed by the U.S. invasion in both Afghanistan and Iraq as part of the "War on Terror" campaign,” initiated by then-President George W. Bush. This situation has massively affected the world, including my own country, Indonesia. Suddenly the word “terrorism” became familiar and people with certain characteristics were suspected as terrorists - the definition and parameters of which are still being debated in Indonesia. In 2002, another sad tragedy known as the "Bali Bombing" occurred, and again Islam and Muslims in Indonesia became a target - accused of spreading the seeds of terrorism. This tragedy somehow has opened eyes for Indonesian Muslims that, on one hand, we could not deny the existence of extremist groups using Islam as a banner to justify their violent actions; and on the other hand, we have an opportunity to step forward proactively in promoting the Indonesian Islam that is more open, tolerant and inclusive. This paradigm offers another Islamic panorama to the global scene, emphasizing that Islam is very rich and diverse, not represented only by a certain region, such as the Middle East where Islam originated. However, when Barack Obama was elected for the first time as the U.S. President, the world’s citizens (including me) had high hopes that this uncertain political situation would improve and that the wars would end. That moment somehow restored my faith in the U.S. as a large nation that had embraced a positive change, a change which would eventually affect the global political perspective for the better. Returning to the different kinds of responses I have received from my family and friends, I found out that most of them were happy for me to be able to experience living and working in the U.S. “It is a privilege for you to be able to go there and experience American life,” they said to me, but at the same time, they were also worried that issues like Islamophobia and the related violence that has happened in the U.S. could affect my experience living here. However, days before my departure, I was also positively advised to manage my expectation about the United States. “Things you have seen and heard about the U.S. are perhaps not entirely accurate in describing America and its people. You need to live and experience yourself, and consider that every single city in the U.S. is not the same.” I did some research on my destination, Philadelphia, as an iconic city where I would live for almost four months, while also working with the Dialogue Institute (DI) through the International Research and Exchanges Board (IREX), an international non-profit program based in Washington D.C. I was selected to join their Community Solutions Program as a fellow in order to improve my leadership potential and broaden my skills to the benefit of my organization, the International Center for Islam and Pluralism (ICIP), and my community in Indonesia. I have spent almost three months in Philadelphia at this point, and have been working for the DI since mid-August. Based on my living and learning experience here, I have realized that the U.S. and Indonesia have some things in common in terms of diversity and multiculturalism. Both nations are large countries that have adopted democratic systems and hold similar mottoes; the U.S. has its E Pluribus Unum, derived from the Latin, meaning "out of many;" Indonesia has its Bhineka Tunggal Ika, derived from Sanskrit, meaning "unity in diversity." The two nations' populations consist of various ethnicities, cultures, languages and religions, and share a similar history - the U.S. occupied initially by the British, and Indonesia by the Dutch. Both countries have also struggled for independence and freedom out of a similar context of oppression; the U. S., of course, has embraced its independence since July 4, 1776, while Indonesia gained its independence officially on August 17, 1945. In its historical journey, the United States is surely richer in terms of civilian experience - including democratic and human rights experience - compared to Indonesia. I have enjoyed my experience of living and learning the diversity and multiculturalism as a Muslim in Philadelphia; as a matter of fact, it has exceeded my expectations. As a Muslim I have no trouble living "normally" like any other Americans who share different faiths than me; and to some extent, I sense that people really do not care about religion. It is true that minority groups like Muslims will still be targets for discrimination, as evidenced by the recent "Clock Kid Incident” in September 2015, where a young teenager named Ahmed Mohamed was arrested at MacArthur High School in Irving, Texas for bringing an alleged hoax bomb to school. The case quickly attracted widespread attention, and most suggested it had something to do with Islamophobia. For me the case is quite interesting; on one hand there is clearly discrimination involved, but on the other hand, the public reaction shows how - in general - Americans are mature enough to support the act against discrimination. I witnessed the public support, including high-ranking politicians and President Obama who strongly supported dropping the charges against Ahmed. For me, it shows that America is mature enough as a nation to stand up against discrimination. My other remarkable professional experience (so far) came when the DI (along with the International Center for Religion & Diplomacy and Peace Catalyst International), co-sponsored and hosted a national Conference on Religious Freedom and Islamophobia in October. It was attended by around 40 Evangelical Christian leaders from around the U. S. (representing a range of views on Islam) to explore and better understand the consequences of Islamophobia and anti-Muslim bigotry, and develop thoughtful responses to Islamophobia in the United States. Selected Jewish, Muslim (including me) and non-Evangelical Christian representatives also participated to help provide a broader contextual understanding of the issues being addressed. During the conference I met with numerous prominent figures who are committed to create and strengthen harmonious interfaith relations in this country. I am convinced that religious freedom and diversity still have a bright future here in the U.S.A.
My personal experience as a Muslim woman who wears a veil is not strange here. In Philadelphia it is quite common to see Muslim women wearing a veil, and even niqab and burka! That is for me very encouraging considering that Islam is a minority religion here. Even in a predominantly Muslim country like Indonesia, these types of veils are not popularly worn. Being a Muslim in Philadelphia is also relatively easy since there are a number of mosques that openly welcome any visitor to come. As an Indonesian Muslim, my favorite place of worship has been Al Falah, which is run by the Indonesian Muslim community in Philadelphia. Despite the number of Muslim congregations here, Al Falah is relatively small, but it is a solid community and provides an important forum for Indonesian Muslims - and non-Indonesian Muslims - to practice the prayers and observe religious festivals together. Al Falah is also open for non-Muslims to come and participate in interfaith dialogue, as was the case recently, when a group of Mormon bishops from Philadelphia came and had an open discussion with the Muslim community of Al Falah. The bishops left with appreciation for the openness and inclusion expressed by the Al Falah community, and how Indonesian Muslims are different from some other Muslim communities they have visited. Speaking of Indonesian Muslims in Philadelphia, I hope that the community will be able to speak more loudly about Islam - particularly Indonesian Islam, which has been able to adjust and integrate with American principles and values without losing its identity. The biggest issue for the Muslim community here, in my opinion, is that they need to be more proactive in reaching out to others, especially those who have a negative sentiment toward Islam. The Muslim community here also needs to hold more intrafaith dialogues to address the different cultures and schools within Islam, and work to create a more unified community regardless of the differences. The dialogue is urgently required among all Muslim communities in order to address issues regarding the practice of religious rights. For example, recently the Muslim community in Philadelphia formed the Philly Eid Coalition, inspired by New York City to work for the inclusion of the two Islamic holidays, Eid al Fitr and Eid al Adha, in the City and public school calendars as observed holidays. However, to make a proposal to the City, the coalition will need to resolve the differences in understanding of the "official" dates for these two holy days. In short, although I have spent only three months living here, I have had a wonderful experience regarding religious diversity. I am impressed by how Americans in general, and Philadelphians in particular, seem to be tolerant, open and welcoming. I am aware that extremism and racism exist in every country, religion and culture, but from what I have experienced and learned while living here, there are ongoing efforts by individuals and civic organizations - including the religious community - to promote and preserve religious freedom and human rights. After all, isn’t freedom the fundamental value that binds Americans together in the first place?